A DISCIPLE LOVES JESUS CHRIST BY STRIVING TO OBEY HIM AS THEIR LORD AND KING. The one who says, “I have come to know Him,” yet doesn’t keep His commands, is a liar, and the truth is not in him. “But when the Son of Man comes in his glory, and all the angels with him, then he will sit upon his glorious throne. All the nations will be gathered in his presence, and he will separate the people as a shepherd separates the sheep from the goats. “What good is it, dear brothers and sisters, if you say you have faith but don’t show it by your actions? Can that kind of faith save anyone? 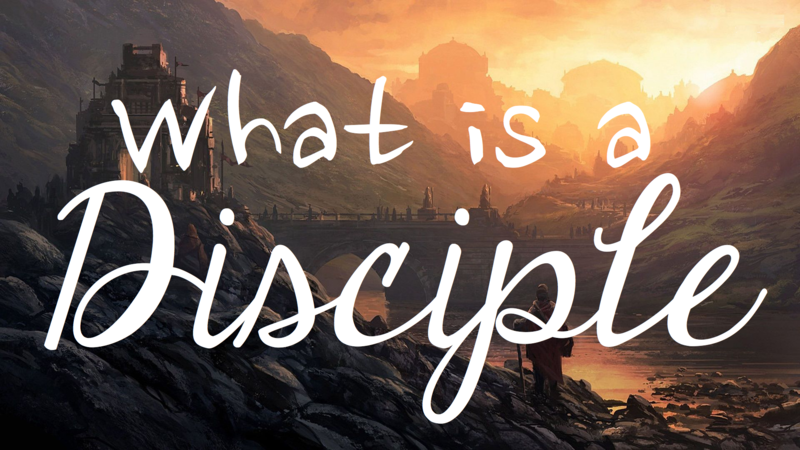 A DISCIPLE FOCUSES ON MAKING DISCIPLES AND ADVANCING THE KINGDOM THROUGH WITNESSING REGULARLY TO THOSE AROUND THEM ABOUT JESUS CHRIST AND HIS KINGDOM. “Go and make disciples of all the nations, baptizing them in the name of the Father and the Son and the Holy Spirit. A DISCIPLE SEEKS TO WALK BY AND FOLLOW THE LEADING OF THE HOLY SPIRIT. “I say then, walk by the Spirit and you will not carry out the desire of the flesh. For the flesh desires what is against the Spirit, and the Spirit desires what is against the flesh; these are opposed to each other, so that you don’t do what you want. I tell you about these things in advance—as I told you before—that those who practice such things will not inherit the kingdom of God. Against such things there is no law. Now those who belong to Christ Jesus have crucified the flesh with its passions and desires. “Now God has revealed these things to us by the Spirit, for the Spirit searches everything, even the depths of God. For who among men knows the thoughts of a man except the spirit of the man that is in him? In the same way, no one knows the thoughts of God except the Spirit of God. We also speak these things, not in words taught by human wisdom, but in those taught by the Spirit, explaining spiritual things to spiritual people. But the unbeliever does not welcome what comes from God’s Spirit, because it is foolishness to him; he is not able to understand it since it is evaluated spiritually. The spiritual person, however, can evaluate everything, yet he himself cannot be evaluated by anyone. For who has known the Lord’s mind, that he may instruct Him? But we have the mind of Christ. A DISCIPLE LIVES AS A CITIZEN OF THE KINGDOM OF GOD/HEAVEN AND MAKES IT THE HIGHEST PRIORITY IN THEIR LIFE. A DISCIPLE LIVES AS A TEMPORARY RESIDENT AND FOREIGNER IN THIS WORLD (LIVE IN THE WORLD, BUT NOT BE OF THE WORLD). “Dear friends, I warn you as “temporary residents and foreigners” to keep away from worldly desires that wage war against your very souls. A DISCIPLE BELIEVES THAT THE BIBLE IS THE WORD OF GOD AND TAKES IT QUITE LITERALLY AND SERIOUSLY. “If anyone hears My words and doesn’t keep them, I do not judge him; for I did not come to judge the world but to save the world. A DISCIPLE BELIEVES IN THE POWER OF PRAYER AND STRIVES TO MAKE IT A VITAL PART OF THEIR DAILY LIFE. ”Then the Lord said, “Listen to what the unjust judge says. Will not God grant justice to His elect who cry out to Him day and night? Will He delay to help them? “Is anyone among you suffering? He should pray. Is anyone cheerful? He should sing praises. Is anyone among you sick? He should call for the elders of the church, and they should pray over him after anointing him with olive oil in the name of the Lord. The prayer of faith will save the sick person, and the Lord will restore him to health; if he has committed sins, he will be forgiven. Elijah was a man with a nature like ours; yet he prayed earnestly that it would not rain, and for three years and six months it did not rain on the land. “Pray at all times in the Spirit with every prayer and request, and stay alert in this with all perseverance and intercession for all the saints.